Mark Gross is an alto saxophonist that grew-up on gospel music at Baltimore’s Mt. Zion C.O.G.I.C., where Mark’s father was the Pastor. The combination of emotion and rhythm naturally transferred to the jazz idiom and the freedom of expression and exploration that the music offered. Gross studied four years at Berklee College of Music and got his Bachelor of Arts Degree in Music Performance. His approach to the horn is based in the jazz heritage, but full of modern attitude, tone, and vocabulary. His album, + Strings, finds the Baltimore native exploring originals and arrangements (3 originals, and 7 standards), both with a sense of purpose and adventure and with, strings! The arrangements are by: Gross, Tommy James, Anthony Branker, Bobby LaVell, and Joris Teepe. Opening the set of ten tracks is a nice arrangement of “Beatrice” by Tommy James. Gross starts out by playing the melody unaccompanied for the first statement of the melody until the cadential figure, and then the band enters. The band is swinging, and Gross’ solo is instantly full of energy and passion as the string quartet can be heard quietly in the background playing supportive figures. Dezron Douglas on bass and Corey Rawls on drums, provide the swinging propulsion. Pianist, Benito Gonzalez unfolds a solo that is full of motivic development and refined harmonic colors. The string quartet takes a nice four bar ensemble passage before trumpeter Freddie Hendrix plays a beautiful solo. The string quartet comprised of: Chiara Fasi – 1st violin, Jennifer Choi – 2nd violin, Celia Hatton – viola and Jennifer Vincent – cello, take a nicely written and orchestrated chorus followed by the melody and a very creative ending. “Brenda Mae” is an original composition by Gross with the arrangement by Dr. Anthony Branker. Gross dedicated the track to his departed sister, Brenda Mae McMillan. The tune is set to a festive Latin groove that has the string quartet feature for the intro. The melody unfolds its beautiful story with an interesting form and orchestration of colors. Gross’ solo is melodic and builds nicely over time and has a joyful, soulful feel in his energy. His use of the entire horn is a real treat to hear. Hendrix’s tone is excellent as he plays over the strings and rhythm section with authority and melodic mastery. The tune is well orchestrated and makes good use of the string quartet and two horns. “Polka Dots and Moonbeams” by Jimmy Van Heusen, is arranged by Bobby LaVell. Gross stunningly plays the well-known ballad’s melody. The arrangement provides support from the strings, while allowing Gross room to expand and contract his lines for good effect. Douglas takes a subtle bass solo with a string voicing floating above his lines. 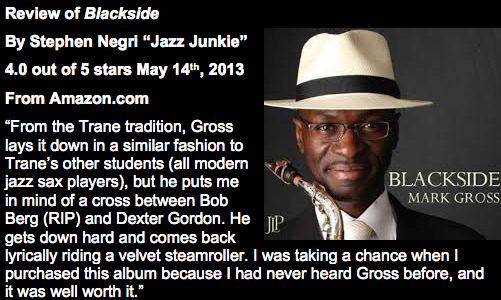 Gross is a player that is certainly based in the lineage and tradition of jazz. The tunes on + Strings have a nice flow, there are excellent solos and the band has solid chemistry. The use of various arrangers gives a fresh perspective to the string quartet sound and the result is pleasing indeed. 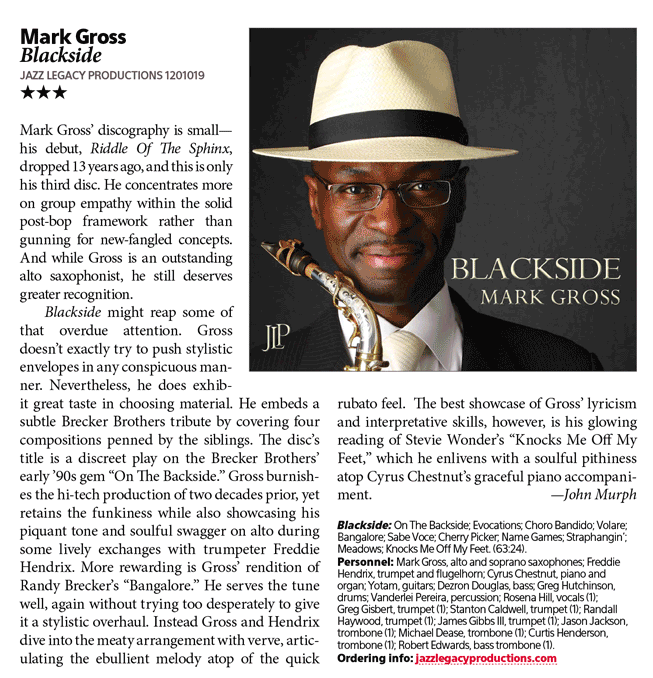 Mark Gross is not a composer and hadn't headlined an album for many years before Blackside. But the saxophonist does possess ample and esteemed experience in both big bands and small ensembles, and was thus able to assemble a top-notch band for this project. He is also creatively capable in myriad styles, ranging from bop through funk, calypso, R&B and Brazilian pop. All these circumstances made choosing the right material problematically open-ended, but Gross and producer/label owner John Lee resolved the issue by selecting songs they like and believe to be underexposed. The result is a fascinating collection with a checkerboard sensibility. Tunes associated with Randy and Michael Brecker are prominent in the mix, but none are from the classic Brecker Brothers discs of the mid-'70s. Instead, Gross goes to the group's final two records in the early '90s for the brawny funk of "On the Backside" and then "Evocations" (co-written by Michael Brecker and Chris Botti), the latter boasting a creamy arrangement for a chorus of horns. He dips into Randy Brecker's obscure 1969 disc, Score, for Hal Galper's "Name Game" (a showcase for trumpeter Freddie Hendrix) and Brecker's own "Bangalore," which Gross galvanizes with a bounce and angularity akin to John Coltrane via Michael Brecker. And he reprises the groove-oriented "Straphangin'," the title tune from a 1980 Brecker Brothers record. All good stuff, but even on the lesser-known material, it is hard to top the Brecker Brothers at their own game. Ironically, pianist Cyrus Chestnut trumps all the Brecker covers with "Cherry Picker," which opens like Ramsey Lewis sitting in with the Crusaders and then goes for some radio-friendly funky bop, with Gross growling on alto. Chestnut beautifully supports Gross' voluptuous horn on "Sabe Você," one of two pre-Tropicalia Brazilian pop songs on Blackside. Another left-field delight is "Volare," a musical piece of provolone that the superb band (bassist Dezron Douglas and drummer Greg Hutchinson round out the core quintet with Gross, Chestnut and Hendrix) dresses up for Broadway and then sidles into a sunny bop-swing swagger. The closer is Stevie Wonder's "Knocks Me Off My Feet," played straight and seductively. What walks on four legs in the morning, two legs in the afternoon, and three legs at night? Man. Cue the drummer's rim shot followed by a bass drum thud. Then give the philosophical riddle a thought or two about how we begin our lives by moving cautiously, move into the fast lane for awhile, and then settle down later on with experience at our side. Along the way we hope to absorb and understand as many special impressions as we can. Alto saxophonist Mark Gross takes us on a journey of ancient Egypt. Recorded in April 1999 the session combines a terrific rhythm section with the exciting interplay of vibraphonist Joe Locke and pianist Mulgrew Miller . Both contribute lyrical interludes that complement the saxophonist's energetic drive and enhance his impressionistic passion. Highly recommended, Mark Gross' latest album provides a tonal picture worth much more than a thousand words. While the thirty-something native of Baltimore, Maryland shows allegiance to John Coltrane, Cannonball & Nat Adderley, Johnny Hodges and Kenny Garrett, his distinctive tone and artistic paintbrush offer much to characterize the individual. Wayne Shorter's "Black Nile" swings hard in a straight-ahead piano trio setting colored by exotic sounds from the udu drum. The familiar jazz melody echoes from alto saxophone with world wise overtones that paint appropriate landscapes. Julian "Cannonball" Adderley's "Marabi" leaves impressions of native dancers and streetwise snake charmers, but with a calypso twist. Billy Strayhorn 's ballad "Isfahan" receives a straightforward approach, while Gross' five compositions weave ancient Egypt around modern jazz. Highly recommended, Mark Gross' latest album provides a tonal picture worth much more than a thousand words. Gross leads a jazzy caravan to where the past meets the present. Gross leads a jazzy caravan to where the past meets the present. Gross's "Valley of the Dry Bones" and the title track (with John LaBarbera on oud) echo Yusef Lateef and Coltrane's exotic, mid-1960s excursions. On Miller's "Eastern Joy Dance," the pianist adopts McCoy Tyner's pointillistic chord voicings, which are powered by Blade's intricate nod to Elvin Jones. Gross's heartfelt takes on Billy Strayhorn's "Isfahan," Kenny Garrett's "Lullabye of Isfahan," Cannonball Adderley's "Marabi," and Wayne Shorter's classic "Black Nile" show off his full alto and soprano sax sound. The twin peaks of the CD are the "The Red Sea," with its bewitching ostinato, and the habaneralike "The Desert Sands of Cairo." The motto of J Curve, this astounding project's record label, is "historic moments in jazz," and they have one here. Another talented saxophonist emerges with a debut CD (U.S Release) that delights and amazes. Most solo debuts are often cautious collections of standards without a lot that challenges. Instead, Mark Gross has emerged with a concept album with Egypt as the theme. And every song is a gem. Five self-penned titles and five others - one each from from Mulgrew Miller (appearing here on piano), Wayne Shorter, Kenny Garrett, Duke Ellington (in a sublime Miller-Gross duet of Isfahan), and Cannonball Adderley. His is a brilliant new voice in the all-too-conservative world of today's jazz. It's a seamless, flowing dynamic whole. One begins to feel something special on the opener "Valley of the Dry Bones" with a marimba solo by Joe Locke followed by a searing, sinuous solo by Gross that ultimately blends and fades with John LaBarbara's Oud. This is inspired stuff, ranking with Randy Weston's Spirit of our Ancestors. Recently Robert Stewart attempted an Eastern-inspired outing (The Force, 1998) with a similar sound but poor production decisions which led many of the tunes into meandering drum solos. No production mistakes here. Each tune is finely conceived and a mini-masterpiece in its own right. Each piece flows logically into the next. An album that guys will like for it's energy and inventiveness and women will relish for it's sesuousness and warmth. My choice for the best jazz CD of 2000 so far. Congratulations to Mark for a spectacular debut. His is a brilliant new voice in the all-too-conservative world of today's jazz. One can only hope he can keep the faith and vision for future projects. The first time I heard "Riddle of the Sphinx" on the radio, I was more than impressed. It took a while to track this cd down, but it was well worth it. Mark Gross' music is fantastic. It's the perfect thing to listen to anytime, whether looking for a boost or something to relax to.